While hopefully skiing in the mountains will continue through April, many Tahoe/Truckee folks are beginning to get the itch to find a patch of warmer temperatures, put on some walking shoes, and stretch out their legs on a dirt trail. I discovered just the ticket last week. After a beautiful morning of cross-country skiing, I headed to the western edge of Reno and enjoyed a short sleeved hike on the Hunter Creek Trail. I highly recommend it. 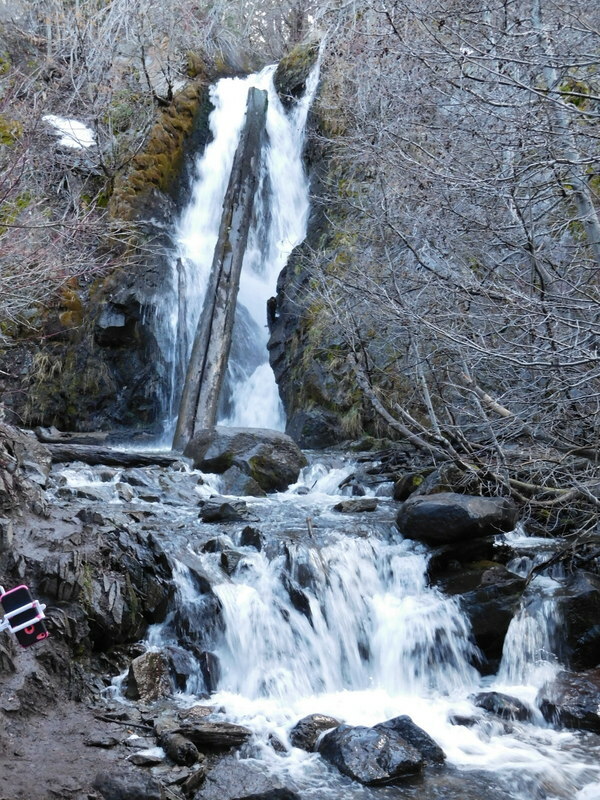 The Hunter Creek Trail begins with a wood plank fording of Hunter Creek before beginning a moderately steep ascent on a traverse along the slope of the canyon. Soon you climb well above the creek, hiking through beautiful, open desert landscape with views towards the snow capped ridgeline to the south, and of downtown Reno behind you to the north. Meadows and side canyons sit enticingly below as you keep ascending towards the forest, which sits above, hard against a snowcapped ridge. About two miles in, you find smoother footing when you reach the forest of Jeffrey pine, white fir and mountain mahogany near the banks of Hunter Creek. Here in the shade, you cross a few muddy sections of trail, before a challenging log crossing of the creek brings you to the base of the lovely Hunter Creek Falls, a double cascade of some 30 feet. 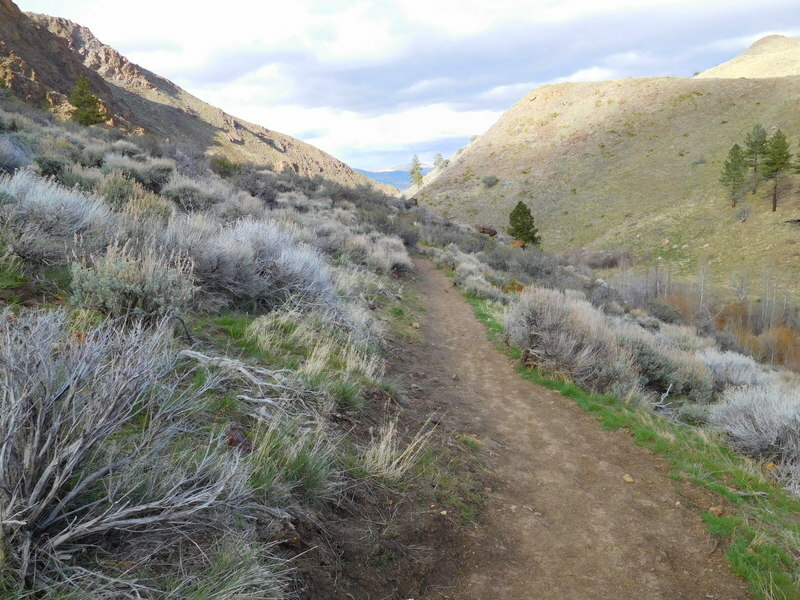 Trail info: The tread is often rocky and children should be careful with footing on the steep slope, but just about everyone should be able to hike this trail. The total ascent on the route is around 1200 feet, with a round trip distance of about 6 miles. This route is popular, especially for families with dogs. While it is a lovely stroll in the springtime on a sunny day, the mostly exposed lower 2/3 of the trail would be a scorcher on a mid-summer day…but by then, you will be hiking in Tahoe. Trailhead directions: Take the 4th Street Exit off of Interstate 80 west of Reno. Follow 4th Street to Mayberry and turn right. Turn right on Plateau, which ascends through a neighborhood for about a mile to a right turn on Woodchuck. Follow this to trailhead parking and restrooms at the Michael D Thompson Trailhead.